CHAVEZ II (SNES - Super Nintendo, GAME PAK) *ULTRA RARE, OOP! * SHIPS NEXT DAY! Chavez II (Nintendo SNES, 1995) Cleaned Guaranteed Working! 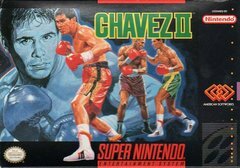 Chavez II 2 SNES RARE! Nice Cond!